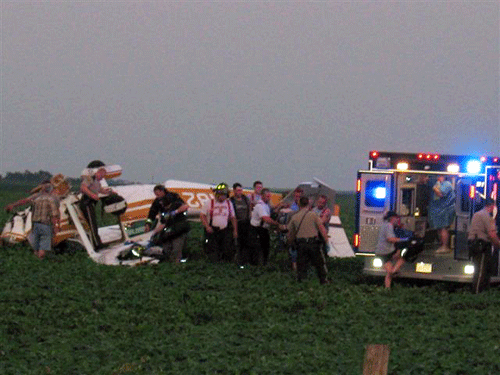 Two men were injured during the crash of a single-engine aircraft Friday evening in western Iowa. The crash was reported just after 8:30 p.m, about six miles northwest of Griswold. Pottawattamie County Sheriff Jeff Danker says the plane was taking-off from a private grass runway following an aircraft fly-in type event. The plane was owned and flown by a 75-year old man from Atlantic. The pilot, and his 59-year old male passenger, also from the Atlantic area, where taking off when the engine stalled. The plane came down in a soybean field and flopped onto its top. Danker says the pilot suffered a possible broken femur, and while a report on the passenger’s condition was not immediately available, his injuries were likely not serious according to the sheriff. Both men were transported by ambulance to a hospital in Atlantic. Their names will not be released until Monday. Danker said the NTSB and FAA will be out on Monday to investigate the crash and crash site.